The antibody detects endogenous level of Abl only when phosphorylated at tyrosine 204. Peptide sequence around phosphorylation site of tyrosine 204 (K-L-Y(p)-V-S) derived from Human c-Abl. Non-receptor tyrosine-protein kinase that plays a role in many key processes linked to cell growth and survival such as cytoskeleton remodeling in response to extracellular stimuli, cell motility and adhesion, receptor endocytosis, autophagy, DNA damage response and apoptosis. Coordinates actin remodeling through tyrosine phosphorylation of proteins controlling cytoskeleton dynamics like WASF3 (involved in branch formation); ANXA1 (involved in membrane anchoring); DBN1, DBNL, CTTN, RAPH1 and ENAH (involved in signaling); or MAPT and PXN (microtubule-binding proteins). 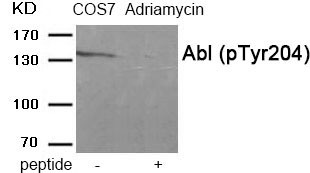 Western blot analysis of extracts from COS7 cells treated with Adriamycin using Abl (Phospho-Tyr204) antibody.The lane on the right is treated with the antigen-specific peptide.